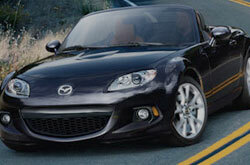 Please look below the video to begin reading a full review of the 2013 Mazda MX-5 Miata. Reliable Mazda is a chief Mazda retailer in Springfield for a reason. We provide you with reviews created by automotive writers at the height of their craft. As you read this article, you'll see that it is full to the hilt with usable data on all of the things you'r looking for in the new MX-5 Miata. Is the Mazda MX-5 Miata right for you? Read on and find out! When comparing the 2013 Mazda MX-5 Miata against the 2013 Ford Mustang, Fiat 500 and the Mini Cooper, and you'll notice that the MX-5 Miata wins over those autos in several aspects. Pay attention to just a few of the reasons below. Get a free warranty on repairs - plus access to authentic Mazda parts and wonderful Mazda technicians - at your chief Springfield area Mazda repair center. Even the quality Mazdas in Springfield can take a pounding, so turn to the Mazda service and autp repair gurus in Springfield at Reliable Mazda. In addition to tough work like engine maintenance, we handle less trying stuff like in-cabin air filter replacement - and this is barely a fraction of what we handle. Also come see us for fuel filter replacement, ordinary oil changes and more. For both complex and incomplex services, our Springfield car repair center does everything; what's more Reliable Mazda offers nominal maintenance pricing. Get started on your next appointment by selecting a money-saving service coupon.